Accoring the CBO, the recently passed health care law would produce a net reduction in federal deficits of $143 billion over the 2010–2019 period. Yet according to Republican politicians and pundits repealing “Obamacare” is a necessary step to cutting costs. Either the non-partisan CBO, who has, for some time, been the objective number cruncher for Congress during times of heavy partisanship is suddenly off its rocker, or a certain political party, in its dedication towards smaller government (at least in theory) and smaller taxes is relying on a series of talking points and myths, while ignoring the math. To be sure, the idea of expanding health care coverage to millions of uninsured while reducting costs seems contradictory, and this makes it easy for the GOP to straw man the health care bill with talk of socialized medicine and government takeovers. So it’s important to take a look at the math behind health care. 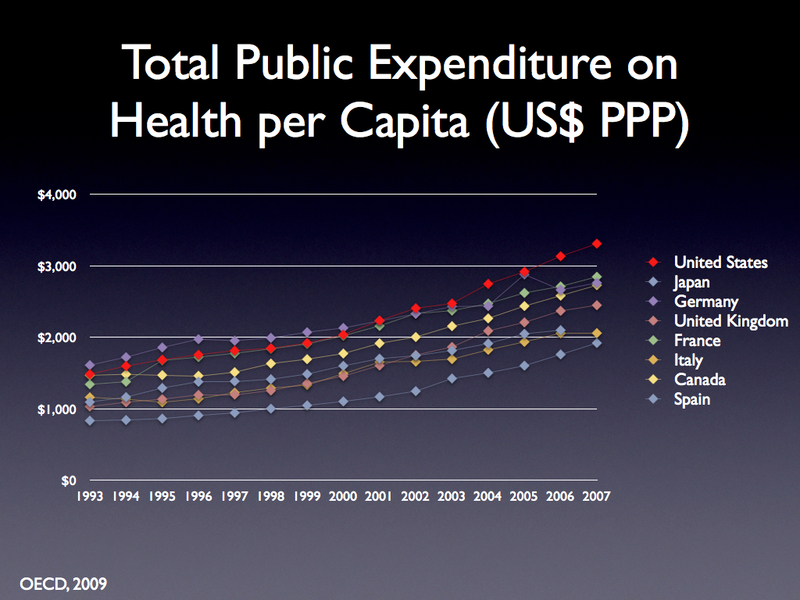 The Economics of Health Care – Why is it so expensive? While there are numerous reasons for the high cost of health care these days, the main factor (the variable that’s changed the most since the not-so-long-ago days of seemingly affordable coverage) is the advancement of technologies. As technology advances and more services are offered, providers must recoup the cost for providing them (think how much cheaper bloodletting was compared to MRIs, chemotherapy, neurosurgery, etc). Because health insurance pays to cover these treatments, they must raise premiums and deductibles in order to cover their costs and maintain their profit margins (any for-profit business model has to). And as a consequence, the people most likely in need of such treatments are the most expensive to insure, which means it’s high-risk people who see their premiums and deductibles raised the most (or are screened out altogether and denied coverage). The graph below shows a comparison between health premiums and wages. The same principle holds true for Medicare. As costs for providing coverage to the average population grows, so does to the cost of providing it to seniors–only more so because seniors tend to have higher health care costs. So Medicare picks up the bill for these increased costs. But unlike private sector heath insurance providers, Medicare doesn’t weed out patients with pre-existing conditions or even raise their premiums. These costs are paid for through taxes, and this is the basis for the “Medicare crisis” (which is really a subset of the larger health care crisis). The way to fix medicare is to fix health care. Medicare takes another major brunt of the health care crisis: Our for-profit health care insurance industry shifts many expenses over to Medicare by not having any real incentive to provide proactive/preventative treatments for later-in-life illnesses as it’s Medicare who will foot the bill for cancer treatments or that kidney dialysis. Medicare costs have become so large that the United States already pay more in taxes alone for health care than countries with public plans (ie “socialized medicine”). Because our privatized health care is so fractured, and its business model treats actual providing of care as a cost, we end up with less coverage for our money. Private health insurance companies spend a lot of money and resources n underwriting (researching potential customers and estimating costs of coverage based on their medical history (as well as their family’s) and habits to figure out how much to charge in premiums/deductibles (or whether do deny coverage altogether). There are also costs; Marketing/advertising, dividend payouts, administrative costs (think of the man hours spent between a health provider and an insurance company in terms of verifying coverage–the health provider simply passes on their portion of the costs on to health insurance company), CEOs/exec salaries, lobbying politicians to not pass any health care bill which might threaten their profit margins and/or market share, ads with scare tactics that misinform the public about such a bill, in addition to maintaining acceptable profit margins. Insurance companies pass these costs onto us by way of higher premiums and deductibles. In a public plan, these added costs (and the highly self-contradictory business model of offering health care coverage, even though actually providing it amounts to a loss) don’t exist. In effect, we end up paying more and getting less health care than other industrialized countries (who do have universal health care). Opponents a public health care plan are quick to denounce the idea due to “government inefficiency” and the usual salute to the free market and its apparent ability to solve everything. But according to the National Health Expenditure Report, private health insurance costs have skyrocketed much faster than its public health insurance counterparts (ie. Medicare, Medicaid). Read the entire PDF here. Below is a snapshot of the report that shows the increased costs in both Medicare and private health insurance! The reason for this, is because in spite of all the talk of “inefficient government bureaucracy,” private health insurance companies are loaded with their own inefficient bureaucracy. In this case, market signals dictate that insurance companies weed out those who need actual coverage the most (or charge them insane premiums/deductibles) in order to stay profitable. 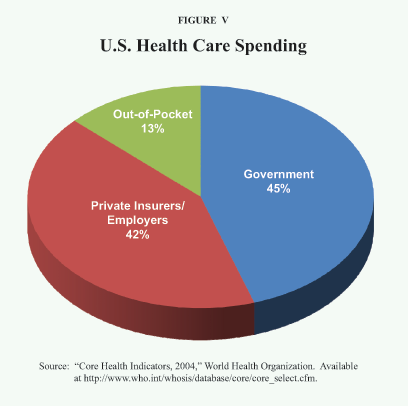 Who Pays for the uninsured? One of the major misconceptions regarding the ‘added’ cost of universal health care coverage is the idea that the uninsured are currently not being paid for. This is far from true. Known as uncompensated care, the cost for health care provided but not paid for is mostly shifted to the federal and local governments. Rather than focusing on the economics of healthcare, Republicans have turned their attention to talking points and misleading labels. Perhaps the most common one is the idea that this is “socialized medicine.” What socialized medicine would look like is this: the government would own the hospitals, clinics and pharmacy companies, and doctors and nurses would work for the government. That is the meaning of socialized medicine (just as our police and fire departments and military branches are “socialized”). At most (in the case of single payer health care, this would be socialized health insurance–which is exactly what Medicare and Medicaid are). In fact, nearly half of all health care spending in the United States is already “socialized” as these two programs, along with other costs (like health care plans for government employees) make up 45% of all spending. So the argument that the “government is taking over health care” is nowhere close to being true. Our health care is still privatized. There is simply a mandate on coverage (and health insurance providers are barred from screening people out for pre-existing conditions) and the industry has tighter regulations. The fact that the CBO scoring showed that the plan would reduce the deficit while also covering more Americans left Republicans in a precarious position. The CBO, being a non-partisan organization, acts as the objective “number cruncher” for proposed legislation. So Republican opposition to the plan ranged from criticizing CBO numbers as unverifiable. The CBO responded to criticisms of their scoring on the CBO Director’s Blog: Uncertainty in Estimates for Health Care Legislation. As the CBO director states, CBO scoring is based on the plan submitted by Congress and cannot take unknown future variables into account (after all, they can’t predict the future). This doesn’t reflect a weakness but rather the irrational criteria for which its critics set. Runaway health care costs were #1! Claiming to have better solutions, the Republican party has in fact offered a few alternatives. Unfortunately, they all fall short of the mark. One such solution has been the suggested increase of Health Saving Accounts, which are great for someone who is young and healthy (and therefore unlikely to ever need this account) and has a high income (as they can pay the high deductible). But this isn’t much of an option for the rest of the country. Another problem is that HSA’s pull the young and healthy out of health insurance pools, leaving an a larger percentage of older/less healthy people in these insurance pools, which raises overall premiums (health insurance companies are able to charge older at-risk patients slightly lower premiums by charging the young and healthy customers slightly more). Tort Reform – Stop the lawsuits! Of the contributors to health care, 1.5% comes in the form of medical malpractice torts. However, Republicans (and others who agree that there exists a health care crisis but insist the answer to reform can’t possibly involve more government) insist that tort reform is the key to lowering costs. The CBO estimated that tort reform would save the economy $54 billion from 2010-2019 (in 2009 alone, health care spending in the US was $2.5 trillion). Aside from the exaggerated sense of costs imposed by medical malpractice torts, something that’s often overlooked is quality assurance they bring. The threat of lawsuit provides health providers with an incentive to deliver quality care. As the CBO states: imposing limits on suits for damages resulting from negligent health care might be expected to have a negative impact on health outcomes. Would Tort Reform Lower Costs? Among the “anything as long as it involves less, not more government” is the suggestion that insurance be sold across state lines. The first problem with this is that states have regulatory authority over insurance. Selling across state lines would lead to a decrease in the comprehensiveness of coverage, as insurers would simply relocate to the state with the lowest standards (and therefore offer the lowest prices). The result, a shift toward cheaper less comprehensive “insurance” which would lead us to the same path of inadequate coverage. Whats the big deal with insuring across states? How Many uninsured people have been insured through Obamacare? Energy Dependence: Can The Free Market Solve It?